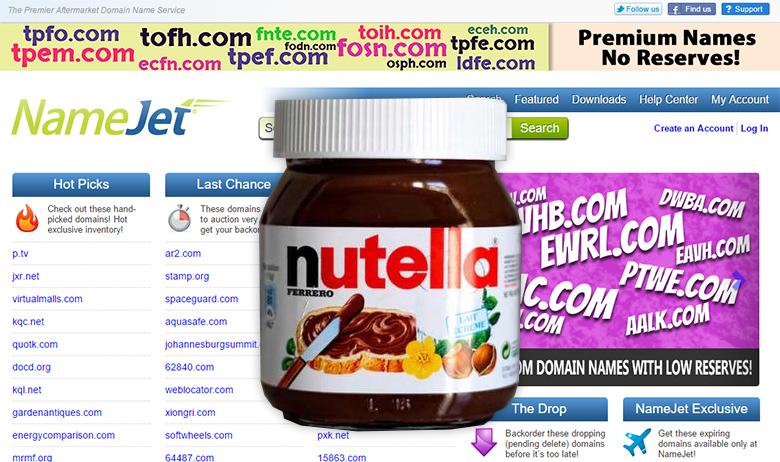 Using NameJet to sell domains is a nail-biting experience. Let me tell you, I wasn’t this nervous when as a teenager my best friend’s mom made me a man. Watching bids blink across the screen one after another, from NameJet giants such as “First” and “TwoTwo” made my stomach clench. As a domain investor, it’s just not the same when you bid on domains, because you’re focused on what you do, you’re in the zone, full of adrenaline. But when you sell domains on NameJet, everything changes. My first resort to combat the shakes, was to have a cup of strong, black coffee. The shakes went away – for about 10 minutes. But as the auctions arrived closer to their final hour, it felt more like a case of domainer Parkinson’s. So finally, I did it: reached for the emergency bucket of Nutella, well-hidden behind a jar of kosher pickles, on the topmost shelf in my kitchen pantry. Feeling all wobbly I did, but first used a large spoon to gobble down Nutella from the oversized container. That’s the one costing almost $8 bucks at Wal-Mart. The company behind Nutella, a registered trademark, went through some class action lawsuit a few years ago, after failing to disclose the sugar and calorie content. I know, because I got a rebate. Don’t hate. But the hell with that, downing Nutella, one delicious, heaping spoonful after another, was the only remedy to offset the NameJet shakes. After the 5th spoonful, I finally reached Nutella nirvana. The shakes went away. The NameJet website colors were radiating, glowing on my screen, moving in curvy paths along with the names of the high bidders. At that point, I could care less if First cussed at me in pinyin, or if TwoTwo made his bids in yuan. My NameJet shakes were gone, and by the final seconds of the NameJet auction I had somehow managed to eat a bucket of Nutella. Remembering Frank Schilling’s wise words about registering Nutella.link, Nutella.click, Nutella.web (not out yet) and Nutella.store from Radix for only $30,000 bucks, I collapsed from sugar overdose. It was a great day at NameJet, regardless. You should try using it to sell your domains, too. Nutella. Eat it while at NameJet. Aged generic .com domain remains unregistered! Care to share what did you sell and for how much? How do you list domains for sale at snapnames?, I wasn’t aware you could do that. Matias – Numerics and generics.